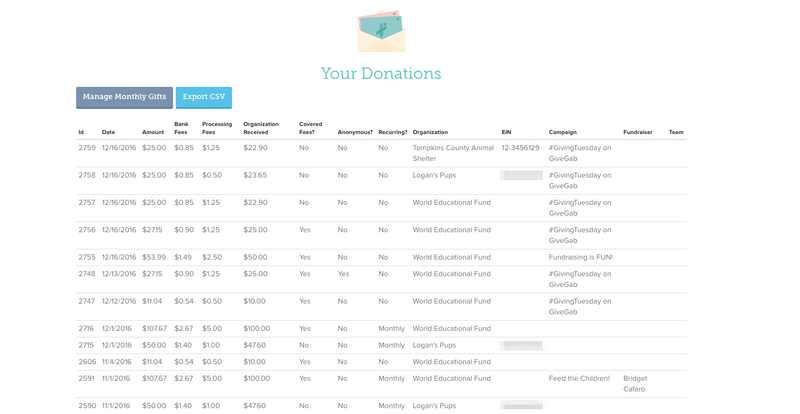 After selecting the "$ Donated" section, you'll be taken to a chart that lists the details of all the donations you've made through the GiveGab platform. From this page you can also view any monthly gifts you've made by clicking the "Mange Monthly Gifts" button. From there you'll be taken to another chart that lists details regarding only your monthly donations. In addition, you'll also have the option to export a report of your donation history. Simply click the "Export CSV" button, and a report will be emailed to the email address associated with your account immediately.